Riverdale has been at an impasse with its teachers over cost-of-living adjustments for seven months. Teachers say they can't afford housing; school officials say they aren't getting enough from the state. One could say Riverdale School District has it all: a 100 percent graduation rate, small class sizes, modern buildings, well-above-average test scores and one of the highest per-pupil funding rates in the state. But the small district tucked in the tony hills between Southwest Portland and Lake Oswego might be the canary in the coal mine for the dual financial crises in the region: rapidly rising housing costs combined with strapped state coffers. District officials and the teachers union have been at a stalemate for seven months over contract negotiations. 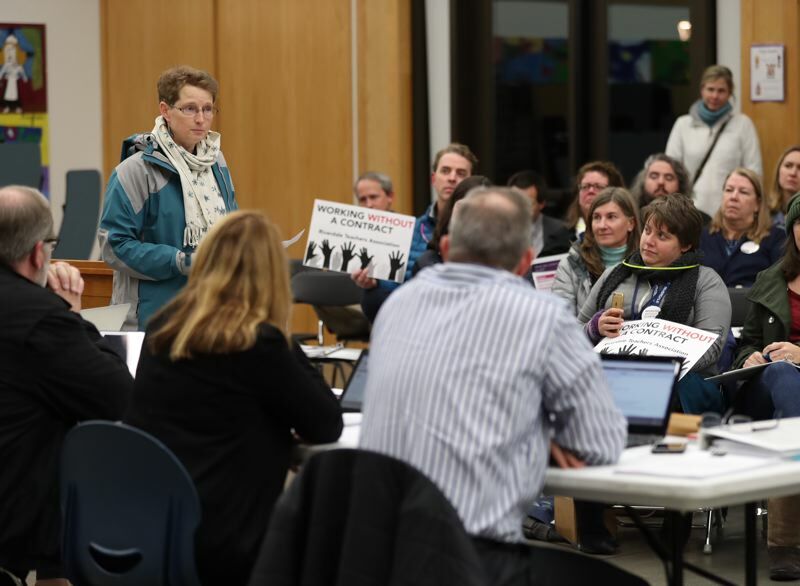 Teachers said the cost-of-living adjustments on the table simply aren't enough to continue to afford housing in the area. But school officials say with Public Employees Retirement System (PERS) costs rising so quickly, no new revenue on the horizon, and four years of deficit spending, they can't afford much more. 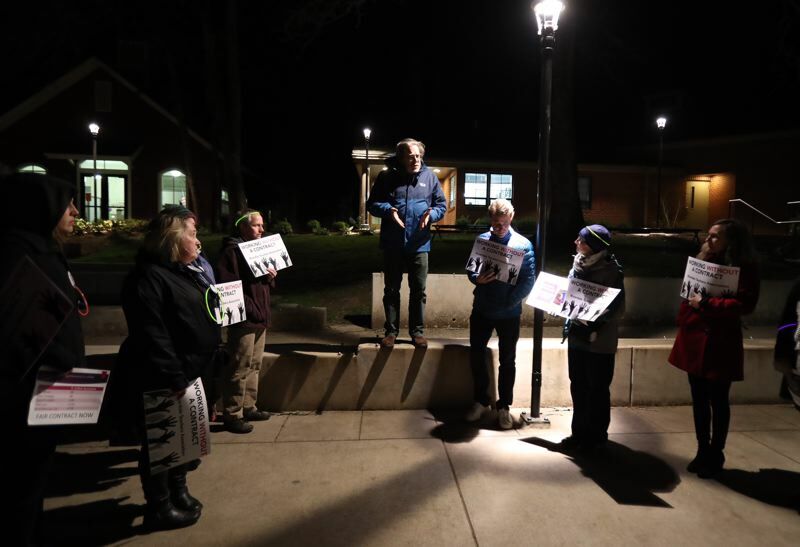 The teachers rallied Monday, Dec. 11 in near-freezing temperatures in a bid to soften up school board members before they headed back to the bargaining table the next day. The Tuesday evening negotiations still didn't reach a deal, however. New negotiations have been scheduled for Jan. 11. The teachers had also rallied during a Sunday open house at the high school. "It made people feel really uncomfortable," said Riverdale Teachers Association President Jeff Brown of the Sunday rally, "and it should, because they are just not valuing us." The teachers had been working on a temporary one-year contract with a 3 percent salary increase until it expired in June. Prior to that, they had a four-year contract. 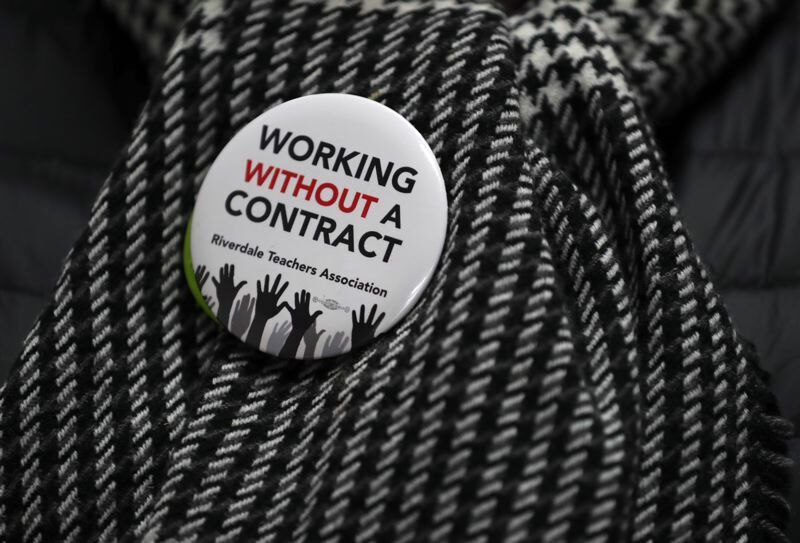 Many teachers wear buttons to work saying they are working without a contract. Otherwise, many emphasized, they leave the conflict out of the classroom. But Brown said as much as his co-workers dislike doing the demonstrations, they feel they are necessary. "The board hasn't really given us any choice. We shouldn't be working without a contract," he said. The teachers at Riverdale know they have it good. Each one started public testimony with how grateful they were to work in a district with supportive families and good funding. "We've got great resources to use, we've got great facilities," said Jennifer Schulz, a Riverdale kindergarten teacher. "But it's not the facilities that teach the kids. It's us." Riverdale Superintendent Terry Brandon, who is retiring at the end of the year, said he believes the only real solution would come from more state revenue. Pension funds promised in better days are sucking up resources, especially at districts with older teacher populations, like Riverdale. The costs of the PERS system are being balanced on the backs of today's school children, Brandon said. "We're one of the worst-funded states in the nation and we have one of the worst high school graduation rates," Brandon said. "I believe those things are connected." The superintendent acknowledged that the district is more privileged than most, but he said the district already puts all its extra money into the classroom. "It's is in the staff. It's not in the bank," he said. PERS costs this year for the district, he said, doubled from about $300,000 to about $600,000, or nearly 5 percent of the district budget. The increase for 2019 is expected to be about the same, Brandon added. Schulz said the union — which represents about 50 teachers in the 629-student district — has heard repeated complaints of teachers unable to make ends meet. Part of this is generational — many of the teachers have been with the district for a long time and bought their houses long ago. As they look to retire, they find the next generation struggling to make ends meet. One teacher, Kristin Lessard, said she had to take on a roommate in her one-bedroom apartment. "I am so disappointed that we are being offered compensation so far below the cost of living," Lessard said in public testimony. School board Vice Chair John Bogaty said he feels for the teachers' financial situations but the district is in the same boat. "The state isn't keeping up with our costs," Bogaty said. He said the district is prepared to offer at the highest levels of compensation in neighboring districts. Brown disputed that characterization, saying Riverdale teachers are paid similar to Portland Public Schools teachers. Salary schedules for teachers are complicated, but Riverdale's looks comparable to PPS. Riverdale teachers make between $39,283 and $80,530, depending on skills and experience, during a 192-day work year. At PPS, teachers make between $38,516 and $78,321 for 190 days. Union officials said Tuesday they came down to a 2.75 percent cost-of-living adjustment for two years from their last request of 3.25 percent. The district countered with 1 percent the first year, 1.25 percent the second year and 1.5 percent the third year. The offer wasn't accepted and negotiations have been rescheduled for Jan. 11. The Bureau of Labor Statistics reported July 14 that in the first half of 2017, the cost of living in the Portland area increased 4.4 percent over the year before. Brown said in the 17 years he's been at the district, the teachers have "never done anything like this" and he worries about the strain on relationships the contract dispute can cause. "We're not trying to be short-sighted or greedy." Both sides said repeatedly they want a "fair" contract. It's safe to say the outcome will depend entirely on whose definition is used. UPDATE (11/13/17): A previous version of this story misspelled John Bogaty's name.